I wouldn’t say a new website design for T-Mobile is monumental news but as someone who appreciates simple and clean websites, the new look is something I’m digging. For some there may be a too much white/empty space, but the site is definitely simplifying the number of options one must choose to move through T-Mobile’s smartphone and rate plan selection. 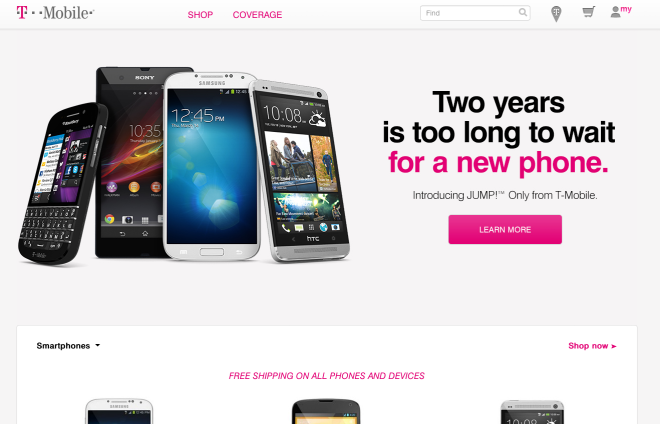 Gone are the scrolling “featured” sites and replaced with one HUGE section promoting T-Mobile’s JUMP! program. Moving further below takes you to the company’s smartphone selection with an option to “Shop now.” Scrolling further down will bring you to the coverage, accessories pages and finally a “Switching is painless” section, a “Why T-Mobile” section and Live chat. What do you think about the new look? Is cleaner really better? I hope it eventually grows on me because I happened upon it last night & I was not a fan. Reminds me of the other carrier websites. Slightly ironic that in becoming “uncarrier”, their website now looks like all the others. What about it reminds you of the other carrier websites? To be honest, I’ve been a T-Mobile customer for 10 years now, so I haven’t spent a lot of time on the other three’s websites, but I would just say the layout in general. Very reminiscent AT&T’s in particular. Not a big deal. I just think it will take some getting used to. I could be getting them confused. Like I said, I don’t spend much time on those sites. I’ve probably visited each one of their sites no more 5 times in the last few years. I’ve never had a beef about the TMo site design. But it is soooo slow. Latency between pages is gawdawful and has been for years. Pretty screens that take a long time to use are not so pretty. I hate having to go to their website…I sure hope it loads faster. They really need to stop giving that money to designers to change the site every month and instead invest it on better servers. The servers running their customer accounts is even worse. Especially when using the T-Mobile app. Yawn.. give me Phase 3 scoops. Data-only plans, giving a new customer credit for ETF from another carrier, ANYTHING! C’mon Beren! I’m pretty sure he posts on the website after he receives the information. It would only make sense. What he said. I can’t post what I’m not sure of or don’t know. I do have an idea what Phase 3 is about but I’m not posting anything about it until I’m more certain. Cmon @davidtmonews:disqus, give us a hint or something LOL. I am hoping for rollover data. Yeah, I want to be able rollover my unused unlimited data from last month. Yes! being on the clean modern face lift. It might take me a minute to get used to it. it is kind of nice looking, but it does take a while for it to load. When I just went to the site to try it, it asked me if I wanted to try the new Beta site. Anyone else get this message? I got it as well. Much simpler UI but still kind of slow. is there an LTE coverage map yet? Thanks for that, now my eyes are bleeding magenta. naw this is a version that Neal Gompa stumbled across. Which doesn’t say anything about LTE coverage vs HSPA coverage. It does… you have to click on the pin… Clunky right? The new coverage map still doesn’t show where there is LTE, HSPA+1900. Also th the faded out names of towns and roads needs to be more visible. I think the new site is a lot cleaner and helps people focus more to be completely honest. I think it looks good. It’s easy to browse through and you can find whatever you’re looking for pretty easily. That would require them investing in upgrading their servers and server software. Clearly they only care about funding pretty web pages and not customer service backend. Looks nice and makes for better navigating . It looks good. I really like the mytmobile beta site. really clean and easy to navigate. how did you get to the mytmobile beta site? and specific address? The new site is work great for Phase 3 but where was the press conference?. Can’t wait for Phase 4 where T-Mobile adds racing strips to their logo so it looks really fast. Now when is TmoNews going to get a much needed makeover? What they really need to do is fix their website so that you can do *everything* you need to do without calling a CSR and make sure *every* possible plan is available. There are tons of current plans that are not visible from the website. First, they need to bring back chat. I really miss that feature. And second, they need to really speed up the MyT-Mobile part of the site. It’s really slow. Still not finding it. If you could provide a link, that would be fantastic. the website forgot to put a 92 in my tracking number. I called and the lady told me within the first few moments of the call to put 92, so it was a known issue. Cleaner is usually better, but it can also be a marketing disguise to less helpful. Put all the answers we need on the site first and then worry about looks. Like the guy said above, why do I have to call to find out when my contract expires? Oh almost forgot, cleaner doesn’t help server speed and capacity much. I still remember a couple occasions when they had a good sale only to see their site crash under the volume and being told to visit a store instead. Get mo’n’better servers, get all the info in and then worry about the looks. ” why do I have to call to find out when my contract expires? Well that’s simple, when customers inquire about their contract, there is a good chance that they are thinking about canceling. We want to get a chance at winning back your business before you make your final decision. So with that being said, we want you to call in so we can find the root cause of you inquiring about your contract status. It would be a poor business decision to do otherwise. Forget the website they need to fix their mobile app like yesterday. It’s horrible and half of the time it doesn’t even work on their own data you need to use wifi. Do they have their wifi caling app available for jellybean devices? 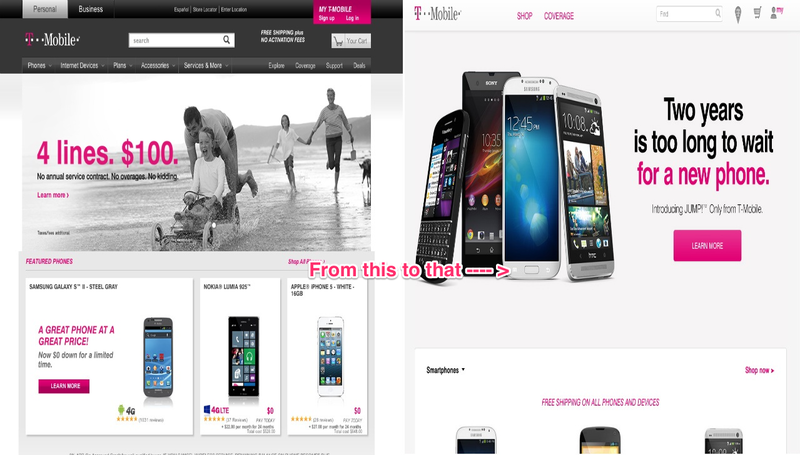 I’m liking T-Mobile’s new website and stores design, its starting to look a lot like Apple’s stores and website. Now T-Mobile needs to work on better rural coverage and adding more tablets to their line up of devices. It is the single biggest issue between T-Mobile and future wide scale success. They need to address the issue, but currently the attitude T-Mobile’s mucky mucks is to belittle rural coverage that other carriers have. Not exactly a good omen for the future. Who knows maybe their plan is to be an urban only carrier, if that’s the case they may be profitable but that will certainly cement their position as a 2nd tier carrier. It’s a big deal for those of us who don’t have any coverage at all. Worse, AT&T is now HSPA+ on 1900 and it’s as fast as T-Mobile in cities that offer HSPA+. The problem with T-Mobile is, leave any city and bang, you’re back on 2G. There are cities in GA…not rural…I mean cities, that once you leave the Atlanta and Columbus metro areas…you go directly from HSPA+ to no coverage, HSPA+ to 2G…but zip! What good is MetroPCS if one, you don’t live in FL and two, you don’t live in thee biggest cities in the US. Travel Talk is great but there’s a catch, it’s CDMA and it is doubtful it will exist after 2015. Did they update mytmobile? Whenever i click on mytmobile from the new website it brings me to the old one! Yes, but its in beta and T-Mobile randomly selects customers to try it out. If it asks you to try out the beta version you can check a box in the bottom left corner and keep using the beta version every time you log in to myT-Mobile. I find that having a Black background with white fonts are much easier to see, and battery savings as well?…When you try to read the T-Mobile site at night, it is so BLINDING because it’s so WHITE!! I really liked the old one with the grey bar up top. #1 rule in marketing is… always assume your public is stupid so dumb things down and make them simple. In this case I think the site looks like @$$.